A holiday gift from Aetheric Arts! Build your own Symbolic Hieronymus Machine with these handy graphics. The Symbolic Hieronymus Machine image can be downloaded and printed out, and should fit nicely on a Letter or A5 size sheet. 1. Print out the Hieronymus diagram and the knob. 3. For a high quality version, glue the laminated diagram to a piece of stiff plastic, bakelite or thin plywood (silicon “goop” is good for this.) Then mount rubber feet underneath at the corners. This give you a solid device that can sit on a tabletop. 3. 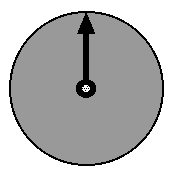 Cut a small hole through the center of the knob, and another hole through the center of the dial on the diagram. Use a suitable length and diameter screw, washers and bolt to fasten the dial to the diagram, so it rotates freely. An alternative to using a stiff backing is to use a piece of 1/4″ thick corkboard and attach the knob with a simple thumbtack. Your Symbolic Hieronymus Machine is ready to use! Here are the particular instructions for using the controls of the Symbolic Hieronymus Machine. 1. Prepare the machine for work by exposing to bright sunlight or by waving a strong magnet over it for at least ten seconds, a few inches above the surface in a random pattern. 2. (Optional) Place a power object, such as a crystal, talisman (or even a small watch battery) on top of the “POWER” section. 4. Stroke the stick pad while concentrating on the purpose of the working. Starting with the pointer on “0”, turn the tuning dial until a stick reaction is felt on the fingers stroking the pad. The easiest way to turn the knob is to rest one finger lightly on it to spin it. If you dial all the way to the “100” without a reaction, turn it back-and-forth and keep scanning until you get a reaction. Alternatively, you can use a pendulum suspended over the Sensor Pad instead of using your fingertips. Tune the dial until you get a pendulum reaction. 5. Release your fingers from the stick pad (or remove the pendulum) and the Machine will continuously broadcast the tuned intention to the target. Anything more complex (and there are many things more complex you can do with a Psionics machine) refer to Uncle Chuckie’s book above. A happy Winter holiday and prosperous New Year to all! NOTICE: I reserve copyright (c) 2010 to the images of the Symbolic Hieronymus Machine linked on this page. No commercial reproduction or use is allowed without permission. This entry was posted in Psionics, Radionics and tagged Hieronymus Machine, Psionics, Radionics. Bookmark the permalink. Great find, or did you draw this yourself? Definitely worth printing this off and experimenting. It’s my own version I drew myself with vector drawing software. I’ve seen other reproductions of the diagram on the web, but they were pretty crude. So I decided to make a nice one and put it out for people to use. Thanks for doing this, a lot of the other drawings look like they are photocopies, so it is great to have one for the digital age. It certainly seems to have an emanation to it, perhaps it is the complex geometry which does this? Prints out well on A4 photo paper, had to reduce it to 39% original size to fit though. Thanks for this. I’ve seen others on the net too. This one is sharper and has a greater sense of realism to it. I like the numbered dial alot too. I plan to print this one out soon. I may even laminate it as you have suggested. Thank you again. Very kind of you. The one seen on the net is usually the image from Astounding Science Fiction magazine by John W. Campbell, reproduced by Charles “Uncle Chuckie” Cosimano in his book, Psionics 101 (republished as Elementary Psionics.) I decided a better one was needed. I hope it proves useful to you! Nice vector illustration, I’ve reproduced a few old patterns in adobe illustrator. Thats the best way to go for high quality resolution. Only problem is the file size needs to be reduced for web posting but still for printing vector over raster at the print shop makes it all worth the effort. Again, good job & thanks for posting.. saves me the time.. I have such a eye for the finer details, if I don’t like what I see, I’ll fix it & make it better. Thanks! I made the thing because I couldn’t find a decent one anywhere! I had to render it as a .jpg (with Image Ready) for web posting but I went with as high of a resolution as I dared. I know what you mean 🙂 recently I was able to look inside a radionics 4 dial box with a trend & witness plate, early model of from 2007. This rad box is a open circuit which means you can plug in any orgone generator of any size, I prefer Scalar waves. In any case, I’m laying out the Schematic as the original. Send me a email & I’ll send a vector illustration once it’s completed. Thank you for allowing me to have a beautiful, useful and clear drawing of this machine. Thought you might want to know, someone appears to be selling your design on ebay. 200849348466 Item number. I really appreciate you offering the design, and it stinks that someone would create one to sell from your work. Yes I know. Since he’s in Romania and I’m in the USA, there is little I can do about it without an international lawyer. I’ve asked him to at least put my name in the credits, but he replies saying I’m harassing him and how can I be so cruel to someone trying to bring healing to the world! Hello, is it possible to just glue the paper to a carboard? Or will that not work? Should I just draw it instead on the cardboard, also does it have to be an highly accurate of the drawing of the picture of the diagram? Also I haven’t build that Orgone pendulum yet, hopefully I will soon! From my understanding, there is no such thing as a symbolic Hieronymus machine. What is commonly referred to as such is actually a John Campbell machine. Invented by Campbell after he encountered the real thing. Hieronymus did not think too much of them and the paper and ink machine even specified a tube which Hieronymus stated “Did not work with eloptic energy” The symbolic Campbell machine is a poor example of a radiasthesia machine, something like the straw airplanes that primitive people in the So.Pacific worship. Anyone who has any success with such a machine will find, that like stone gods, it seems to work but then stops. Perhaps the offering of a young virgin or a slaughtered goat might make them start back up, but this is the basis of all stone idol worship, IE radiasthesia machines equal stone gods. Abraham’s father was a maker of stone idols. One day, while Abraham’s father was in town selling his wares, Abraham at the tender age of three, took a hammer and smashed the idols left at home. Upon returning home, the father asked what happened to the statues. Abraham replied they smashed themselves. His father answered back “nonsense there only stone and have no power in and of themselves”. Abraham replied. “Then why do you worship them” It was at that moment that God chose Abraham. Take a lesson from Abraham and avoid radiasthesia machines. If you want to experiment with radionics get a real machine, if you insist on experimenting with radiasthesia, try a ouija board but beware you won’t be the only one using it and there is no way to neutralize them. Friend…this is interesting, even if it’s not what I hope to hear! 1.You say ‘From my understanding…’. 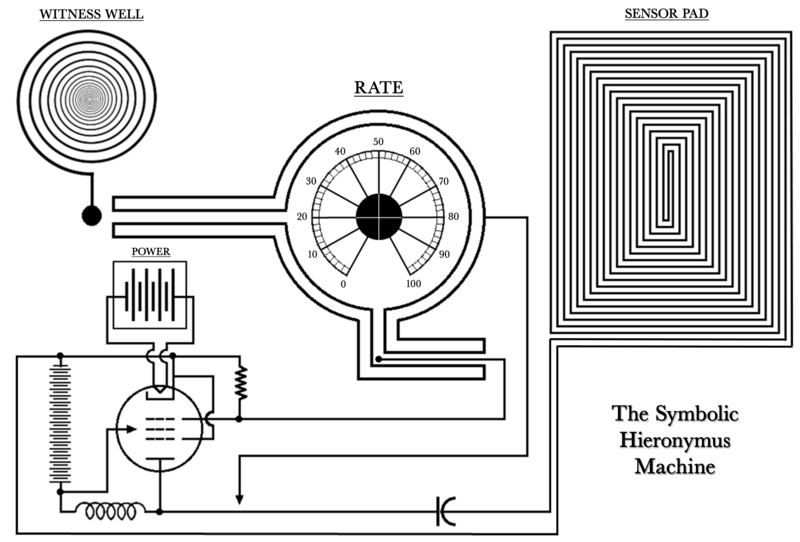 Are you able to enunciate what that understanding is about radionics that is at variance with the symbolic machine. 2.You say ‘…it seems to work but then stops.’ Can you explain that a little more?
. I am but a novice at radionics & quite frankly I can’t afford the manufactured units available. I saw the symbolic HD or say on e-Bay a few years ago & thought it would be a good starting point for me the novice – but still out of my price range. I am sincere & mean no disrespect but any lead would be appreciated as an explanation might be lengthy & I don’t want to waste you time & so a lead would be good. I may come back for some guidance/clarification. My understanding is that it is the operators intent that is important for successful operation, something akin to dowsing, but more so. Any comment would be helpful either here or by email. Well, no, it’s not electronic parts. Neither is a Goetic talisman, or a magical sigil. As the title says, it’s a SYMBOLIC Hieronymus Machine. Read the article.